This ever popular Riviera 48, with glass enclosed Flybridge, is the ultimate blue water sports fisher. Outstanding is the only way to describe the reputation of this ever popular Riviera 48 glass enclosed fly bridge blue water sports fisher. Launched late 2000 with twin caterpillar 3196 660hp diesel engines on shafts giving you a cruising speed of 18-22 knots and a max of 29. 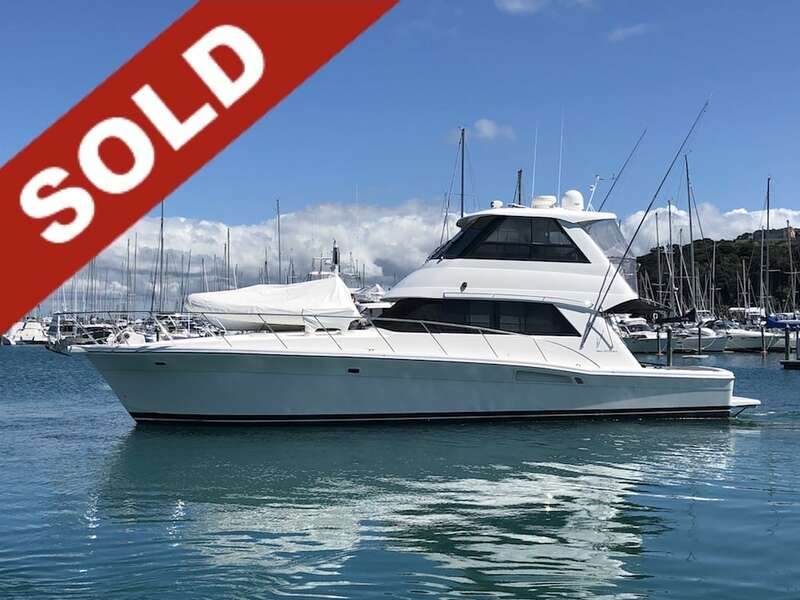 This 3 bedroom 2 bathroom vessel is equipped with a chart plotter, fish finder, radar, auto pilot, VHF, CD Stereo, TV and DVD player, water maker, washing machine, dryer, genset, davit, and a 3.6 centre console tender with a 60hp yamaha outboard. The Riviera 48 hosts a large galley with full size fridge/freezer, a twin couch saloon which opens out onto a large teak cockpit with cockpit table and cockpit freezer, and a coffee table upstairs in the roomy, air conditioned fly bridge. This vessel is in very good condition and well worth viewing.